If you follow the Epic Backlog, you might know that I haven’t had the best relationships with the Western RPGs in my life. I seem to experience the reoccurrence of a hopeful beginning that has in nearly all cases given way to an overwhelming sense that I’m playing the game completely wrong. In retrospect, I have been playing these games wrong. My difficulty with the genre has been my inability to construct viable characters (and parties). Western RPGs are often based on complex rulesets, such as the ever popular Dungeons & Dragons, and I seem to have a very difficult time wrapping my head around the nuances that they present. Perhaps I’m an idiot, but I typically get more enjoyment from games with simplified or abstracted rulesets (such as Torchlight, Baldur’s Gate: Dark Alliance, and most JRPGs). That doesn’t mean that the promise of an epic journey doesn’t tempt me into purchasing (more than) a few Western RPGs. This particular sub-genre is well represented in my backlog. When I purchased BioWare’s Dragon Age: Origins on Steam, I was hoping that I might actually finish the entire game, lest I shame myself in front of my devoted readers. I encountered a point in Dragon Age: Origins, where my character-building deficiency became quite apparent. I played through the origin story of the human noble 3 or 4 times, at which time I was on the verge of giving up. Luckily, I was able to turn to the internet for assistance; I referenced the MyCheats Superguide for an excellent guide on how to build a competent party (found here). Once I surmounted this initial challenge, I really enjoyed Dragon Age: Origins. The story told therein is easily on par with a decent fantasy novel you could pick up at your local used book store. The quest finds a nice balance between complete linearity and being too open, which I perceive as a weakness of the genre. The strength of the story can be observed through the characterization present throughout the game. Many of the characters are a delight to converse with, and the conversation system itself truly allows the protagonist to come across as an important part of the events, rather than just a silent leader. One of the things that Dragon Age: Origins succeeds at is providing challenging battles. Almost any encounter could result in the death of one or more of your characters if you don’t take the time to define the tactical behaviors that your party members should follow in the likely event that you encounter baddies. In many occasions pre-defined tactics won’t be enough, and you have to carefully monitor (and manually control) the actions of your team. Frustration is likely to occur, but so is a sense of satisfaction. Yet as much as I enjoyed the story and combat in Dragon Age: Origins, I was constantly haunted a major technical defect in the game. It’s very, very poorly optimized. In order to play the PC version at an acceptable frame rate, you’ll want a computer that exceeds the recommended system requirements. If not, you can be assured that console version will play nicely (although, the console versions lack isometric perspective to which most WRPG aficionados are accustomed). 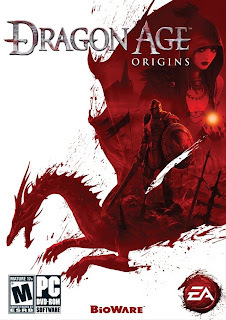 Dragon Age: Origins is probably the finest Western RPG that I have ever played. While that probably isn’t saying much, the fact that I actually completed the game (and enjoyed most of it) says a great deal about the quality of the extraordinary experience that it provides. I’ve come away with an enhanced understanding of how to tackle unfathomable evil (teamwork, teamwork, and more teamwork) and a greater appreciation for the genre. I look forward to more open-ended adventuring.